ILE À VACHE, Haiti, Aug 8 2014 (IPS) - Calm waters lap the shore beneath stately coconut palms. Mango trees display their bounty alongside mangrove forests. Goats graze peacefully on hillsides. These words were written, however, before mangroves were cleared for an international airport, coconut palms were bulldozed for a road, a bay was dredged for yachts and some 40 police officers came with weapons and three all-terrain vehicles to quell protests. Islanders, estimated at between 14,000 and 20,000, are angry at their exclusion from the government decision-making process that has opened the island for investment in an international airport, hotels, villas, a golf course, and an underwater museum — investments that place residents’ futures in limbo. On May 10, 2013, President Michel Martelly decreed that the island was a “public utility,” zoned for tourism. “The decree says that no inhabitant of the island owns his land and that the state can do whatever it wants with it,” said Kenold, a member of Konbit Peyizan Ilavach, Farmers Organization of Ile à Vache, formed to oppose the project. Minister of Tourism Stephanie Villedrouin Balmir, who declined an interview for this story, has said that no more than five percent of the islanders will be displaced, that they will be relocated, not removed from the island, and that they will be compensated for their losses. But involuntary relocation is unacceptable to the islanders, who have held several large demonstrations since December demanding retraction of the decree. The government reacted to the protests by beefing up police forces and throwing KOPI Vice President Jean Matulnes Lamy into the National Penitentiary, Kenold said. Officials say Lamy is detained on charges unrelated to the protests, but activists say his imprisonment is political. Kenold said, charging that when he was away from home police ransacked his house and took money he’d saved for his children’s school fees. He said they’ve harassed and beat others, and now islanders live in fear of the police. Before the demonstrations, there were just three or four police on the peaceful island, he said. Islanders say they don’t oppose tourism – they might benefit by getting electricity, potable water and government services. But they don’t want to be moved from their five-room homes with spacious yards for trees, gardens and animals, to crowd into two rooms up against neighbours. And they worry about the island’s fragile ecology. There’s concern as well for the waters surrounding the island. They “began dredging a pristine bay known as Madam Bernard without an assessment of the environmental impact on marine ecosystems,” Jessica Hsu of the NGO Other Worlds and radio host Jean Claudy Aristil said in a joint presentation at a July Innovators in Coastal Tourism symposium in Grenada. The project has already impacted some islanders economically. School director Dracen Jean Louienel told IPS that people had used the mangroves that were cut down for the airport to produce charcoal. “That was how people made their living,” he said, “This destroyed their livelihood.” And building the road removed coconut trees on which other families depended, he said. Louienel said, moreover, promises of work have not been fulfilled. “People signed up to work on the road, but few were hired,” Louienel said. Some islanders, however, have profited from the project and support it. Standing in the clearing where the airport is to be built, Gilbert Joseph called the project “a wonderful thing.” Joseph works as a security guard there at night and sells beverages to the construction workers during the day. Clausel Ilmo, whose son is working as a translator for the Dominican road-building company, also likes the project. He pointed out that where it once took hours to walk to distant parts of the island, one now can go quickly on the road by motorbike. Up the hill from Guerrier’s church, Sr. Flora Blanchette, a French-Canadian Franciscan nun who’s run an orphanage on the island since 1981, shared her hopes and concerns. New roads can help people access health care, schools and food, she said, but the fruit trees that nourish the children should be protected. In Costa Rica, the whole population has benefited from tourism, Elizabeth Becker, author of “Overbooked: the Global Business of Travel and Tourism” told IPS by phone. There, locals have input into development, she said. 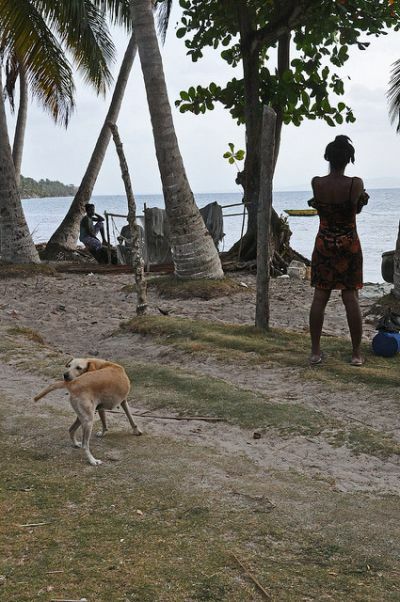 Implemented correctly, Haiti could greatly benefit from the booming tourism market, she added. Cambodia’s tourist development provides a cautionary tale, she said. The government took away people’s property rights and parks protections and did not consult locals before installing hotels and airports. Haiti’s Ministry of Tourism emphasises environmentalism. 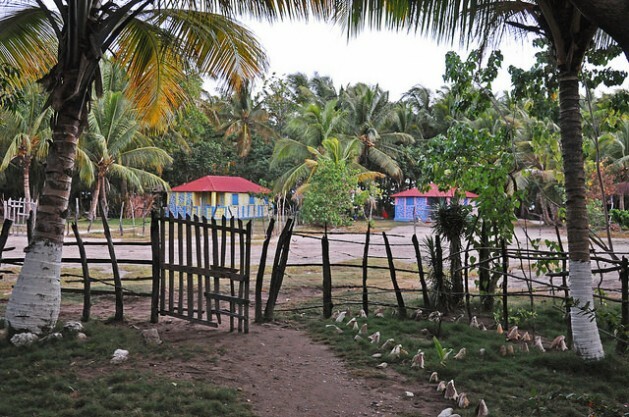 The Ile à Vache “project objective is to develop sustainable tourism based on the practices of ecotourism,” an online ministry slideshow says. But islanders say the government hasn’t demonstrated care for the environment. Documents also say the government will undertake a “social improvements programme.” It has recently dug new wells, built a community centre, installed outdoor solar lights, and distributed rice and fishing equipment. “I’m not against tourist development, but it’s the way they’re going about it,” Kenold said, adding that people are open to dialogue with government officials, but only after the decree is retracted, Lamy is released from prison and police are removed from the island.